If someone says, ‘hemp,’ what do you think of? Wait – let’s try that again. If someone says, ‘hemp,’ here’s what you should be thinking: Super plant. Hemp is a plant that has been used for centuries with countless applications in paper clothing, rope, building materials, and more. (Fun fact: The Declaration of Independence was written on hemp paper). On the top of the plant you’ll also find the hemp seeds, which are the source for nutrition-packed foods like hemp hearts, hemp powder, and hemp oil. Hemp seeds are high in Omega-6 and Omega-3 acids, and they are higher in protein as a percentage of weight than beef, chicken, fish, peanuts, or almonds. 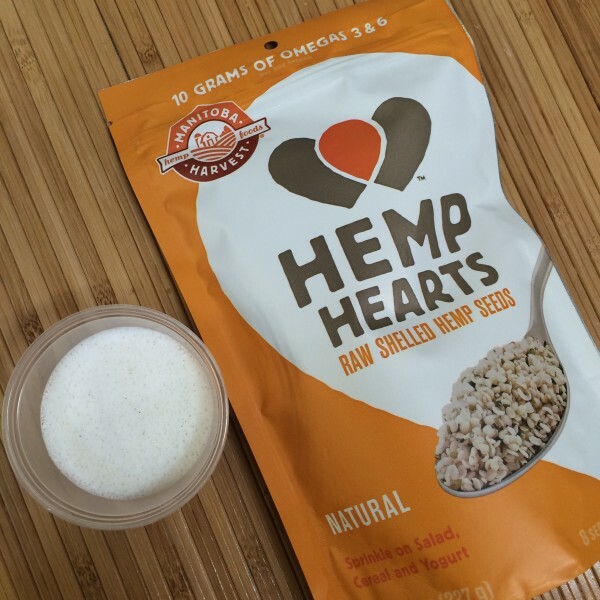 Recently we’ve been enjoying hemp hearts from Manitoba Harvest, which grows its hemp in Canada. 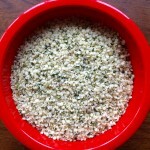 The hemp hearts are the product that comes from shelling and de-hulling the hemp seeds. They are like little soft grains that are tan-colored with flecks of green. 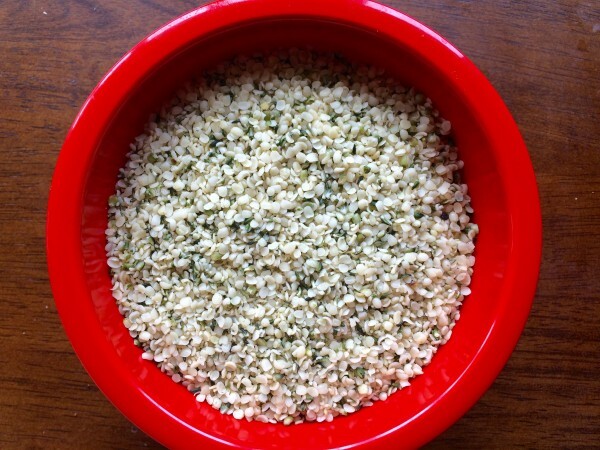 How do you eat hemp hearts? You can sprinkle them over cereal, salads, or yogurt. Or, as we learned in a recent Manitoba Harvest demonstration, you can use them to make unbelievably tasty hemp milk at home. Seriously, it’s so easy and it’s amazingly frothy and creamy. Manitoba Hemp Hearts next to a small cup of freshly blended hemp milk. Combine the water and the hemp hearts in a blender. You can adjust the desired thickness by using more or less water. Blend on high speed for 2-3 minutes, or until creamy and smooth. 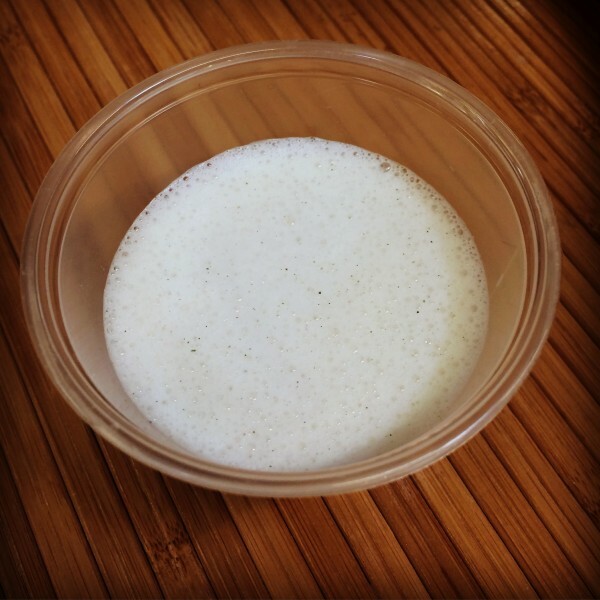 Blend longer for a foamier milk. If desired, strain the milk with cheese cloth prior to serving. Sweeten or flavor as desired. Once you’ve made your milk, you can sweeten or flavor it to your heart’s desire (sugar, honey, agave syrup, cocoa, cinnamon, and so on). You can pour it over cereal, incorporate it into cereals, or use it in baking. It’s very versatile, and taste-wise, it got a big thumbs-up from our kid tasters. Now, what was that about hemp preconceptions? Lots of people associate the hemp plant with marijuana, and although it is a species of Cannabis sativa, it is NOT the same as marijuana. It contains only 0.001% Tetrahydrocannabinol (THC) and will not cause a psychoactive effect, nor will it cause a false positive drug test. Hemp had been a staple crop of U.S. agriculture since the 1600’s, all the way until 1937, when a marijuana tax act lumped all hemp production together with marijuana (even though hemp has zero drug value). Despite efforts to change the laws and regulations, hemp is still prohibited from being grown on U.S. farms. Nevertheless, as modern-day nutrition-conscious people continue to discover the value of hemp, U.S. sales of hemp-based products have now reached over $500 million per year. The first week of June has now been named Hemp History Week , which is a grass-roots effort to lobby on behalf of hemp farmers and build hemp back into becoming a profitable U.S. agricultural crop. To learn more about hemp and its fascinating history in the U.S., visit the Hemp History Week site. Blogger disclosure: I received a free sample of hemp hearts from Manitoba Harvest. Manitoba Harvest is one of the advertisers who participates in the Healthy Ad Network, of which Jolly Tomato is a participant. I did not receive compensation for this post. All opinions expressed are my own.